In Denver, Colorado, a law has been passed making it illegal to camp on city streets. 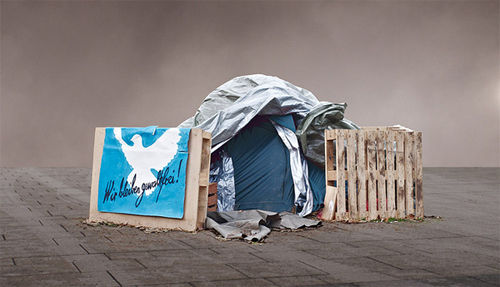 Meanwhile in Frankfurt, Germany, Councillor Frank has called for a deadline by the end of the month: when time runs out, police will remove the Occupy Frankfurt camp immediately. An important era will probably end there. 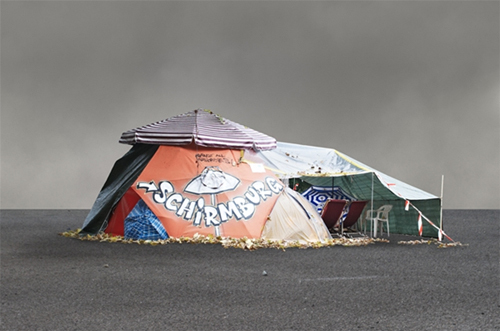 In recent months tented camps around the world have become a synonym to nomadic resistance and collapsible architecture in the context of protests and demonstrations. Especially in Germany’s financial capital is a striking contrast between the imposing but lifeless skyscrapers and the movement’s improvised camps and architectures. These new urban districts were captured by german photography studio Frank Bayh & Steff Rosenberger-Ochs in a series entitled »Die Entwicklung neuer Stadtquartiere im Herzen der City«. 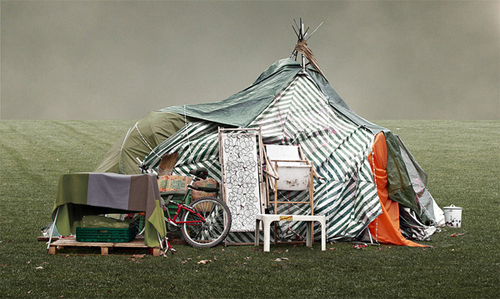 The pictures here where made at the tent camp of anti-Stuttgart 21 campaigners in Stuttgart’s Schlossgarten park and the backgrounds were replaced with various types of surfaces.